Hey, Lolo! (Sorry … Bar Lolo.) So great to see you the other night. It’s been a while, and we have to say you are looking good. Really good. You’ve taken some time to focus on yourself, and it has paid off. It looks like you’ve kept the best of what attracted us to begin with, and made a few small, but standout changes. First, we adore the pops of color — those coral-crimson chairs and bar stools, the wall of colorful paella pans and the natural wood wine holder really stand out against the cool putty colored walls and floor. And the blinged-out longhorn cow skull over the door proves you haven’t lost your sense of humor. We’re also totally digging the fact that you’re really getting back to your tapas-bar roots. The high wooden tables along the window scream Madrid. I see J and I and our fellow neighborhoodies dropping in after work for a glass of Albariño, cider or a cocktail, and a few small bites before a night on the town. You’ve also made a few positive changes to the menu. We sampled quite a few tapas last night, including our longtime favorite shredded romaine salad, but I have to say, those specials you whipped up: Warm mission figs topped with Serrano ham and Gorgonzola? Are you kidding me? I thought I’d died and gone to heaven with that salty-sweet medley. I’m so glad we placed a last-minute order for the special paella croquettes — crispy fried spheres, perfectly proportioned, oozing with hot saffron-scented paella, chicken and shrimp in the middle. Incredible. We also love that you ditched the full-size burger in favor of delicious mini lamb sliders. Such a treat. And though we didn’t need them, we could not resist the piping-hot churros with chocolate and honey dipping sauces. You really outdid yourself. It was good catching up, Lolo. You look good, and you seem to have your groove back. The makeover has done done wonders, and I hope it gets you the attention you deserve. Maybe we can hang out sometime? The croquettes and lamb sliders with the mission figs? Serve it with a crisp Sauvignon Blanc and I’m there! 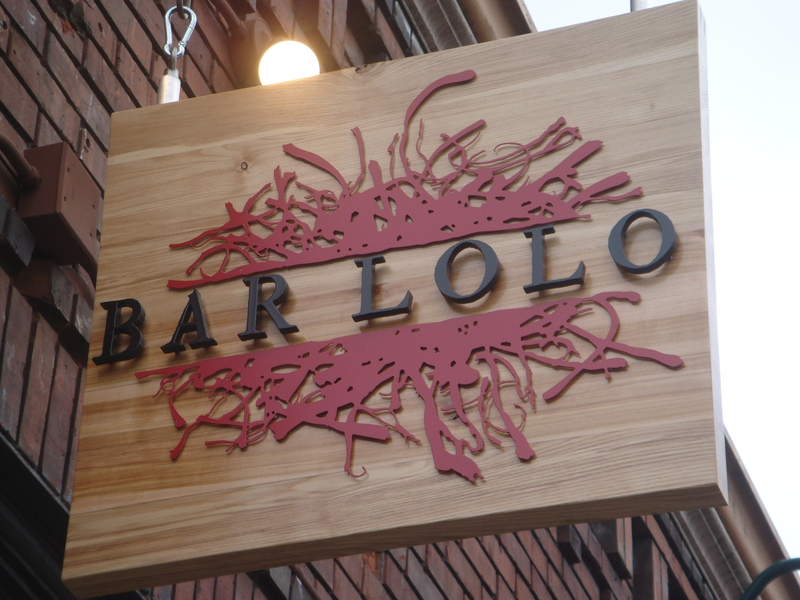 Can’t wait to see Bar Lolo’s facelift next time I’m in Ptown. Thanks so much for a great review of the new Bar Lolo! Just wanted to point out that the reason for all the great changes is that Bar Lolo is under new ownership. We, former Lolo general manager Kate Verrill and partner Rick Barnes, bought the establishment back in August and did a remodel/rebranding in early September. We were so pleased to see you recognized our intentions with the rebranding to create a more true, authentic tapas bar feel. Look forward to seeing you soon and be sure to say hi! Great job with the place, Rick and Kate! We enjoyed our recent dinner, and look forward to coming back soon.